Simply enter your first name and preferred email address in the form. We will deliver the full-color poster in English via email. Then, to get any of the other languages, simply click on the language link in that email. We will deliver the poster in your selected language. Why do it now? The back of the poster has a summary of all the teaching points about practicing Responsibility and leading yourself first. Thanks to Zeina Tahan and Marwan Jaber for the Arabic translation. Thanks to Alexandre Freire Kawakami for the Brazilian Portuguese translation. Thanks to Dr. Marc Beckers and Dobromir Karamelski for the Bulgarian translation. Thanks to Zuzana Sochova for the Czech translation. Thanks to Yves Hanoulle and his colleagues Eva Lemaire and Corry Clybouw for the Dutch translation. 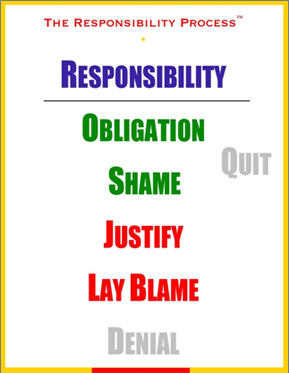 Hanging the poster in your home and office where you will see it supports you in practicing the three keys to responsibility: Intention, Awareness, and Confront. Thanks to Arto Eskelinen for the Finnish translation. Thanks to Yves Hanoulle, Philippe Launay, @pablopernot and www.areyouagile.com for the French translation. Thanks to Dr. Marc Beckers and his colleagues for the German translation. Thanks to Guy Nachimson for the Hebrew translation. Thanks to Hajni Altamirano for the Hungarian translation. Thanks to Dadi Ingolfsson for the Icelandic translation. Thanks to Erik Talboom, LoghaD and Ralph Fink for the Klingon translation. Thanks to Lane Kagey for the Malay translation. Thanks to the executive team at Thermal Dynamics for the simplified Chinese translation. Thanks to Sergey Dmitriev for the Norwegian translation. Thanks to Asad Safari for the Persian translation. Thanks to Sywliusz Pytka for the Polish translation. Thanks to Cátia Oliveira (@CatOliv) and also Joao Martins for the Portuguese translation. Thanks to Sergey Dmitriev for the Russian translation. Thanks to Dusan Kocurek for the Slovak translation. Thanks to Joakim Holm and his colleagues at Adaptiv for the Swedish translation. Thanks to Arunthep Sangvareethip for the Thai translation. Thanks to Baris BAL for the Turkish translation.